Desk.com is an online customer service software and support ticket help desk application for small business and fast-growing companies. You can turn your Desk.com site to a multilingual knowledge base using Transifex. Below, you'll find instructions for localizing your Desk.com site. Before you begin, you must have a Transifex account and a project you will be associating with your Desk.com site. If you have not already done so, sign up for Transifex here. From your Desk.com dashboard, select the Channels tab from the nav bar at the top of your screen. 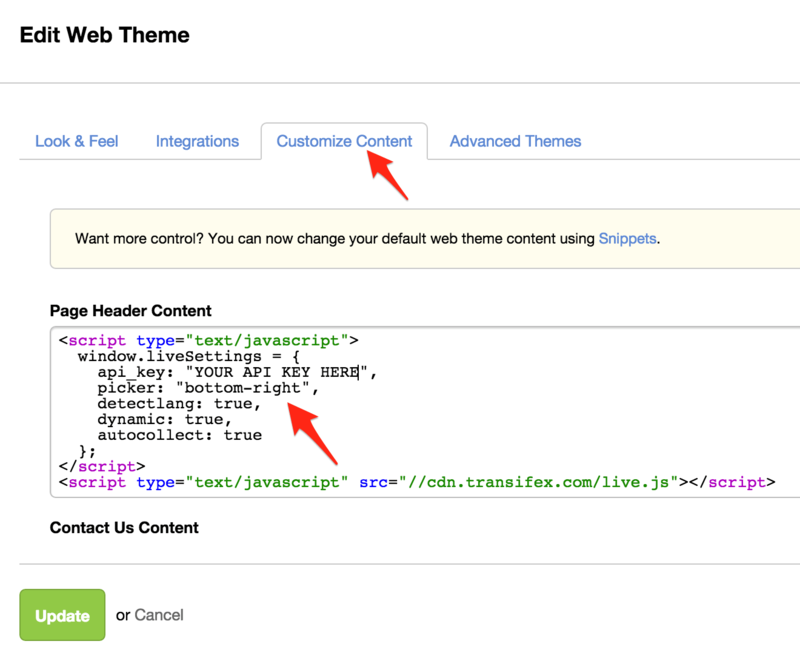 In the left sidebar, under the Support Center menu, select Web Themes and then click the Gear icon on the right of your theme. Under the Edit Web Theme window, select the Customize Content tab and scroll to the Page Header Content section. Now you can begin save and translate content! Now that Transifex Live is embedded in your page, you can use Transifex live to save content to Transifex, translate in context, and publish translations on the fly. Dynamic content like dates, times, and counters (e.g. # of articles, # of comments, etc) should not be translated. When approving phrases in Transifex Live, be sure to ignore these types of nontranslatable dynamic content. If your platform lets you edit the theme, you can mark mark elements of your pages as nontranslatable. To learn how, click here.